Simple, illustrated textbooks for those whose first language isn’t English are rarely complete. Complete ones are often hard reading. This one is complete, illustrated and easy to read. Click here for the preface and contents list of an early version. 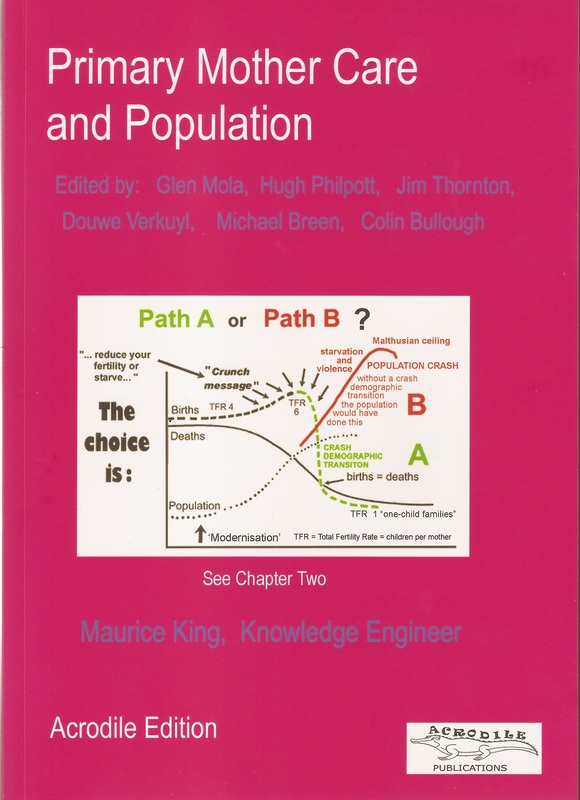 Thirty years work by experts with hundreds of years experience in developing countries, assembled by Maurice King, the knowledge engineer. Previous books, Medical Care in Developing Countries, Primary Childcare, Primary Anaesthesia and Primary Surgery, published by Oxford University Press (OUP), each sold many thousands. But OUP turned this one down because of chapter two. Dr King says that Africa, and many other developing countries, are demographically trapped; they’ve exceeded their carrying capacity and must drastically control their population. He uses strong language. Some people wish he’d left that chapter out – women are dying in childbirth and need the rest of his book. But he insisted. So Acrodile Press printed 10,000 copies in Shanghai. And subversives like you and me are getting it where its needed. Over 400 packed A4 pages. 700 illustrations. No author royalties. The Amazon price is £17, but it’s much, much cheaper for you. For a limited number of free copies (first come, first served) send your postal address to jimgthornton@hotmail.co.uk, and promise to pass it on to the next person you know who visits Africa. If you are a doctor, teacher, educator, or anyone else with contacts in the developing world, £60 plus £10 p&p, will get you a box of 14 copies. That’s less than £5 each all in. Given them to your students to take on their adventures. Chapter two? You’ll probably agree with it, but if not tear the pages out before you pass it on! Dr King needs you to get this book to those who need it. Please help. Thank you I can use all I can get I come here often.